The Mutt's back with more vermi-composting chatter. 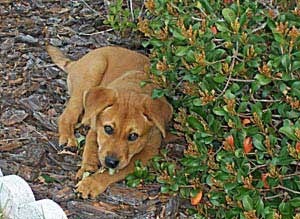 Digger's photo from his dating service profile. So far, we've gone over three main compost worms: Red Worms (red wigglers), European Night Crawlers, and Indian Blue worms. Each of these worms can be used successfully in a worm compost bin. But, did you know you can use a mix of compost worms and improve your results? Sorry, the cat satellite just went over. Polly chased her evil twin Ester right across my keyboard. It's not enough that I have to put up with endless hair balls, messy kitty liter, and infuriating furniture scratching (I prefer chewing.....chewing is infinitely more satisfying.) If all this weren't enough, I have to tolerate these rude interruptions. I can't write like this - I'm taking my laptop out to the doghouse. I prefer writing here under the table. There aren't as many distractions like rabbits, birds or the occasional squirrel. If those cats would just stay up there on the curtain rod where they belong! 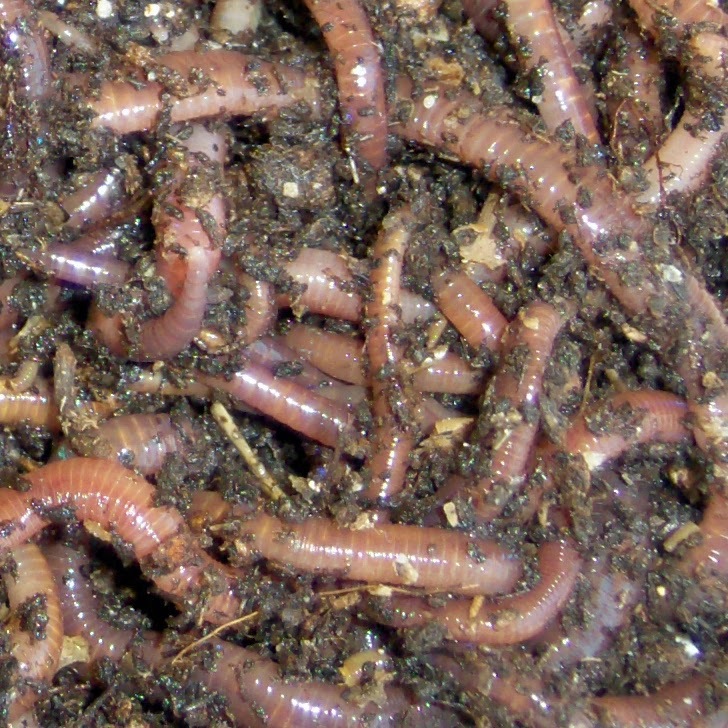 One reason for mixing composting worms in one vermicompost bin: Red Worms, European Nightcrawlers and Indian Blue worms feed in different levels in the worm bin bedding. India Blue worms are "top feeders" only, staying in the top most layer, actually involved in the food. Red Worms will feed in the top layer, then clean up what the India Blue worms leave behind after a new batch of feed is placed on the surface. European Nightcrawlers are "burrowers", making tunnels in the bedding and following them up to feed from underneath the food. The benefit of including European Nightcrawlers in your worm population is this burrowing activity. Since the Red Worms and Indian Blues stay in the uppermost part of the bedding, compaction can be a problem. The European's help by moving up and down through the bedding. The composting process is accelerated, you'll harvest your worm compost quickly, usually before compaction becomes a problem. You should always check your bedding periodically to see if the bedding is compacting and to check the moisture level. Another reason for using a mix of composting worms: The worms have different food preferences. And the European Nightcrawler will eat larger chucks. By using a mix of worms, you'll have worms residing in different parts of the bin, with different eating habits and preferences. The bin is healthier because all the food is eaten and worms are moving throughout the entire bedding materials. No need to worry about the worms interbreeding because they'll only breed with their own kind. The "hybrid worm" doesn't exist. Mix Red Worms with Indian Blue worms. Mix Red Worms with European Nightcrawlers. Mix all three. Have a ball! Composting Worm Combo: Red worms, European Nightcrawlers, and VermaPlex® in one box, saves on shipping.